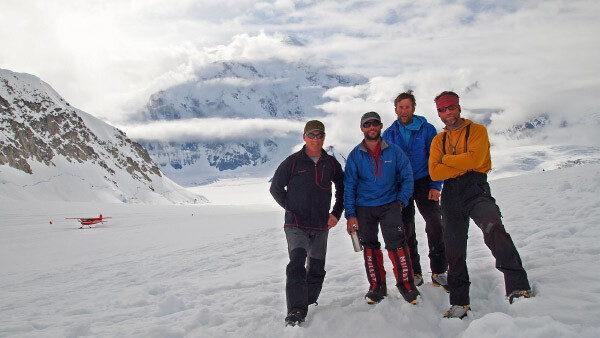 In June 2013 all eight climbers of an Army Mountaineering Association team successfully summited Denali via the West Buttress route. The team comprised four regulars and four reservists who had been selected from an army-wide trawl and subsequent training weeks in JSMTC Ballachulish, Scotland, and an exercise rehearsal in Saas Fee, Switzerland. This trawl looked for team members with prior mountain experience and the training plan developed this further. By the time the team deployed all members were at least WML, AML of WCL trained with most holding a clutch of qualifications. 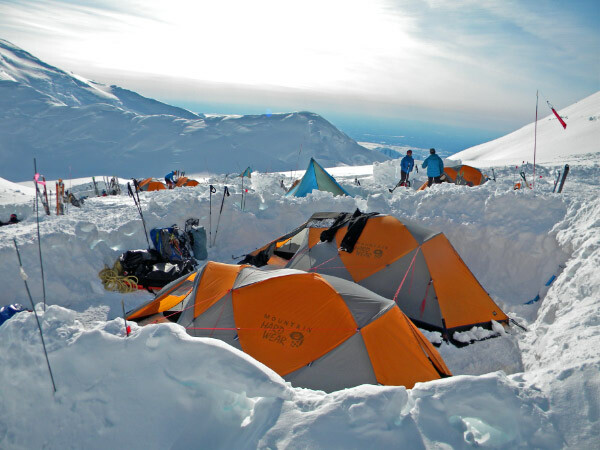 By the end of the selection and training the team was one of the most qualified/experienced expeditions to attempt Denali. 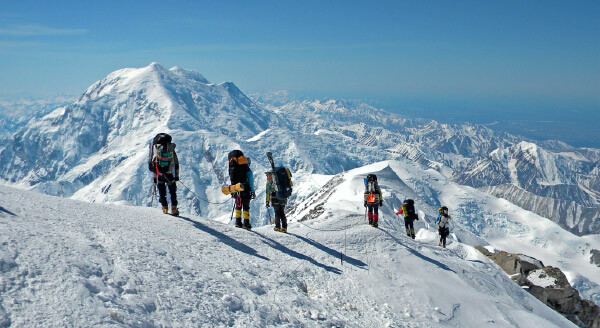 Denali was first summited in 1913. The North West Buttress has had a quiet history due to access and is very dependent on good conditions to climb. Its first ascent was in 1954 and it had yet to be climbed by a British team. Flying in to Anchorage, the state capital of Alaska, Denali could be seen in the distance hovering over the clouds; an inspiring if a little daunting first sight. In Anchorage, we to sourced some last bits of equipment and the rations. The next move was northwards to the town of Talkeetna on the edge of the National Park. At Talkeetna we saw the park rangers to register, be briefed and draw the ‘clean mountain cans’ to ease pollution in the camps. We packed at the airstrip next morning. With a remarkably laissez-faire attitude, they recorded the weight of all equipment and loaded us up in a de-Havilland Otter and, after a spectacular flight through the foothills and an alarmingly close pass past over the northern flanks of Mt Hunter, we scraped over a serac-strewn ridge to the makeshift landing strip, marked out with sleds. 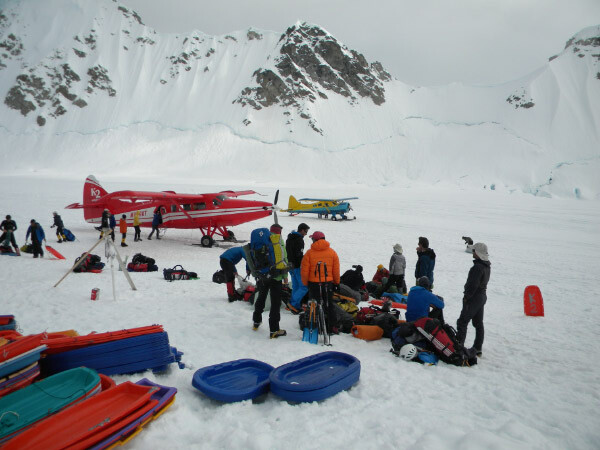 We camped beside the airstrip and packed our sleds and bergens, and headed off onto the Kahiltna Glacier for the long haul upwards. 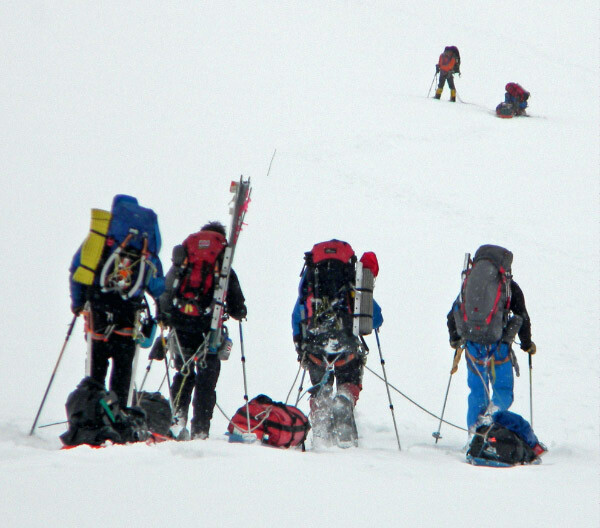 After a few hard days of hauling sleds loaded with 30 days rations and mountaineering kit, often in poor visibility, hugely variable weather and temperatures, we reached the turning point on the route, where we could drop off the first cache of food/fuel for later climbs. Rested and lightened, we then cached the first load of supplies at Motorcycle Camp, just above the Kahiltna Pass, up into the Jenet Basin. Firm snow and clear weather made for near-perfect conditions and the team moved well. Soon the team were established in Basin Camp where we were able to acclimatise at 4330m. The rangers base in the camp gave a daily weather forecast, and a high-pressure system looked set to linger over Alaska for several more days. Clear skies and light winds persisted as we took the first load of food and equipment up to high camp, tackling the headwall; a 1000m face behind the camp topping out on the West Buttress with a system of fixed lines. At 5245m High Camp perches precipitously above Basin Camp with eye-watering views to the west. After a night of noisy, returning, exhausted climbers, we set off for the summit at 1015 (to avoid the worst of the cold) on Wednesday 29 May. Moving well, we gained the Denali Pass in little over an hour; significantly less than previous groups we had seen, and kept that pace up in near-perfect conditions past Archdeacon’s Tower until the final slog up Pig Hill, the last steep section up onto the exposed summit ridge. The ridge drops mesmerically to the south through layers of churning cloud over such famous routes as the Cassin Ridge stretching some 3000m below. Weaving the cornices, using the in-situ snow stakes for protection, and taking in as much of the view as we could, we soon reached the summit at 1505 for a wind-hastened photo-shoot. With clear visibility down to about 4500m, the sea of cloud allowed but a few peaks to poke through adding an exaggerated sense of height and grandeur to the highest point in North America. 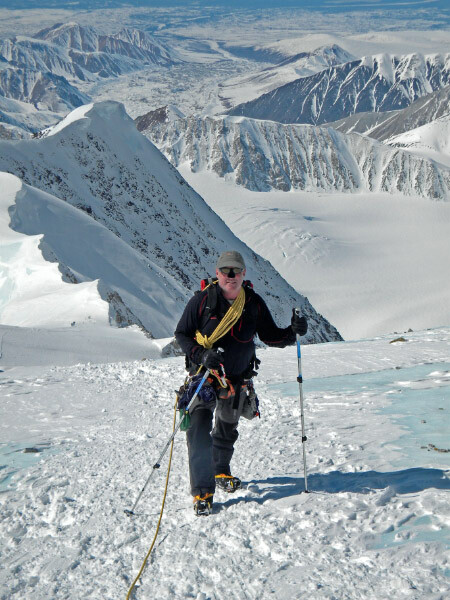 Elatedly, and benefiting from the increase in oxygen on each downward step, we made quick progress off the summit with the two rope-teams passing on the Football Field to get back to High Camp at 1810; well inside the guidebook time and half that of most of the other groups. 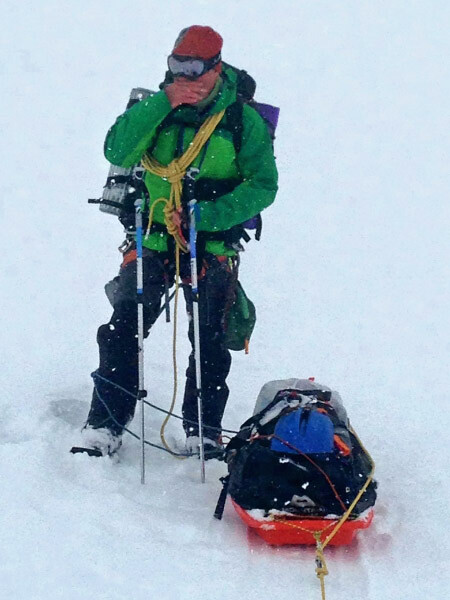 Capt Chris Wright, suffering from the altitude, had to turn back 200m below the summit and was taken down by the first rope team. He re-ascended successfully with Maj John Tolan two days later. 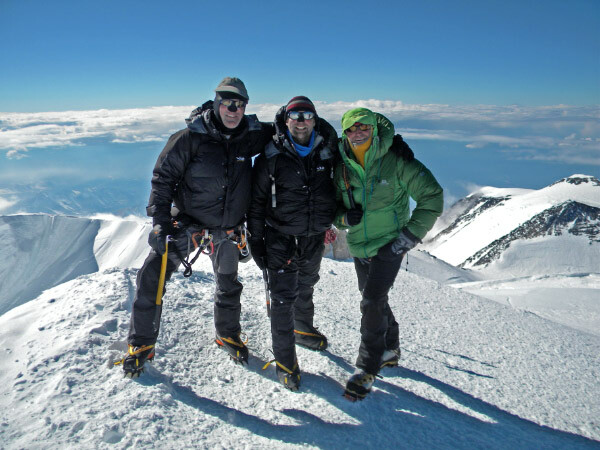 Having all successfully climbed Denali, our attention then focussed on the NW Butress. Our window of high pressure was coming to an end and whispers of the ‘ten-day-storm’ were passing up and down the mountain. We had all hoped to be able to get over to the NW Buttress, requiring a descent to the Kahiltna Pass; the site of our first cache, so the process of collapsing back down through the camps began. In preparation for the NW Buttress, a cache was carried across a deceptively nasty ice face and crevasse field and up to 5000m to our planned final camp on the route. Everything was in place for the ascent if the weather would hold. What had been long and tiring haul up the mountain, turned into short, tiring and frustrating descent. Sleds do not traverse well downhill and through gritted teeth and with tested humour we made it back to the Kahiltna Pass in rapidly worsening weather and, by the time the tents were up and the cache had been recovered, the snow was falling fast. The forecast on the satellite telephone proclaimed ‘some snow’ but little other detail for the next four days. Numerous plan revisions for the NW Buttress were calculated and pushing the timings as far as we could – it became clear that unless the snow stopped soon, there would be too much snow on already loaded slopes, and too little time for consolidation, for the route to be achievable. The depressing, unavoidable, decision was made that we were out of time to complete the route and so would to descend back to the airstrip to get out. The recent warm weather had transformed the Kahiltna Glacier, with many open crevasses on the route where it had been firm on the ascent. Arriving at the airstrip in early afternoon, we were met by the backlog of climbers waiting for snow-hindered flights and began the long wait at the back of the queue. A final night on the glacier, eased by a particularly harsh celebratory Canadian whisky, led into another day of waiting until late that evening we finally left to be welcomed back into Talkeetna with a glut of burgers and beer. Little remained to be done other than kit cleaning, drying and packing, and some well earned rest. The exercise has undoubtedly been a huge success. 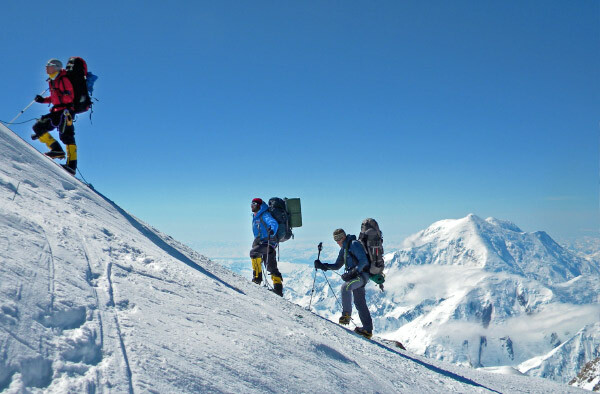 The 100% success on the summit of a 6000m peak which is regarded to be harder than many of similar heights, is testament to the team’s and leader’s planning and preparation, a well-considered ascent profile, dedication and hard work on the mountain, and a certain amount of luck with the weather and conditions. The expedition would have not taken place without the generous help of the Ulysses Trust and other grant authorities as well as the support of the chain of command. The AMA team comprised reservists Maj John Tolan, Capt James Gordon, LCpl John Sealy and Tpr Gareth Steele. Regulars included Maj Matt Swannell (Leader), Maj Chris Wright, Capt Ivar Milligan and Sgt Swift.